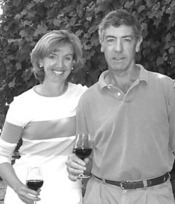 It’s been a while since we’ve done a LENNDEVOURS Q&A, so I tracked down Peter Carroll, who owns The Lenz Winery. My current Lenz favorite is the 2001 Old Vines Cabernet Sauvignon. Why? Because it’s just a very, very good wine. And growing cabernet is challenging on the east end of Long Island–even on the warmer North Fork. So producing one that is deep and rich and age-worthy is a real achievement. Thanks Sam (McCullough), our vineyard manager. For example, Lenz is generally credited with learning why the early wines on Long Island were having a problem. The soil here is high in aluminum. Aluminum is toxic to vines, even in small quantities, but it is generally ‘unavailable’ to the vine roots…provided the soil acidity is not too great. But our acidity level is naturally high and had been raised further by the potato/cauliflower agriculture that generally preceded the grapevines. The acidity/aluminum problem was affecting the vines pretty badly. We figured out the problem and hit on a solution easily enough, in about 1989–Put a lot of lime on the ground to lower the acidity and render the aluminum inert. We decided to speed the process by using granular lime (more expensive) and cutting it deep into the soil rather than using only surface lime and waiting for its effect to sink down to the roots. By 1993-1995 this had made a huge difference and the wines we released in 1995-1997 were of vastly higher quality than anything that went before. This illustrates how a change in the vineyard can take nearly a decade to reach the consumer. When someone tasted a Lenz Merlot in 1997 and said, “Whoa! This is pretty good stuff!”, the origins of the improvement were way back in 1989! Is there a ‘classic’ wine or wine and food pairing that you just can’t make yourself enjoy? No. But if I stretch, I guess I’d say Sauternes with seared foie gras. But to be honest, the problem I have here is less the combination than, remember that I’m English, that the foie gras just needs to be cooked more. Wine enjoyment is about more than just the wine itself. would make (or has made) for the ultimate wine-drinking experience. First, I definitely agree with the premise. I invariably enjoy Lenz wines more when I drink them at a restaurant than when I taste them at the winery with Eric (Fry, the winemaker). In the latter case, the purpose of tasting is invariably to judge the wine in some respect. Such tasting is generally critical. There’s little sense of just leaning back and enjoying it. The key, I think, is relaxation. A perfect setting might involve dinner at the end of a day in which much else has been accomplished, with a mixture of family and friends plus at least one new acquaintance around the table. The food, too, might be a blend of old and new–dishes I knew I liked but with some new ingredients or a new approach to preparation.